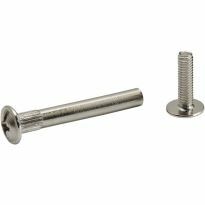 These steel threaded inserts can be used anywhere you want the strength and easy assembly of a bolted connection with a wooden joint. Simply bore a hole, drive in the threaded insert, and use a bolt of the appropriate length to secure the adjoining member in place. Perfect for eliminating stripping and pull-out problems in knockdown furniture. See below for individual sizes. Size listed below is the size of the bolt (sold separately) that threads into the insert. Thread and hold tighly into wood. Slot drive remains intact. Perfect for securing a top to a mobile cabinet. Be sure to get the installer tool. Makes install EASY! Works great. Had to make a jig so I could install them straight. Used to attach the top to a TV component cabinet. Recommend. 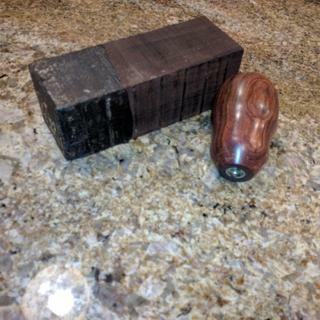 I’m a woodturners and you need something to gauge the depth of a bowl when turning works great .i used the inserts & threaded knobs with a 1 x 2 x 12 piece of wood with a dowl. Rockler is a great company very knowledgeable & easy to do business with !!! Everything was as described and went together without any problems. Have not used these yet, but I have use the quarter inch ones and was delighted on how well they work. They were used to attach one side of my purple martin house. This makes it easy to remove for easy clean out. The threaded insert tool that I ordered to install the inserts works Great. Works so well that I am going to order the 1/4 & 5/16 inch tools with my next order. Thanks Rocker for making my woodworking projects easier. Worked great for securing the corners of my bed frame project. The threading seems strong and smooth. Used to assemble corners of a bed frame. Also, drilled a counterbore to insert screw hole buttons. 2. adding leveling legs to workshop furniture such as benches. 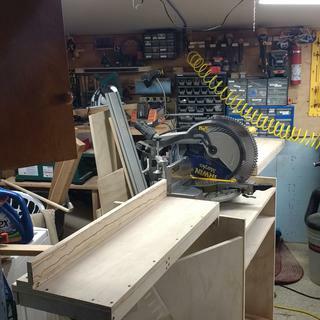 3. making wood shop jigs adjustable. 4. making equipment fixtures adjustable. Make sure that you drill the appropriate size hole. A 15/32" diameter bit works for most woods, but I usually make a test hole in a piece of scrap before drilling in my project wood. (I have used a 7/16" in some mahagony.) A 1/2" deep hole allows for the insert to seat at the proper depth when inserted. I drill a 5/16" diameter hole in the center of the 15/32" hole at least 1" deep. 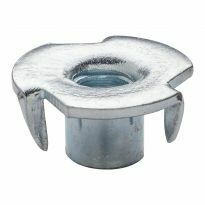 The 5/16" hole allows for the bolt to be screwed past the 1/2" depth of the insert. I resist the urge to glue the inserts in the hole. The only time I have used glue with the inserts is when the force would be pulling the insert out of end grain. I did this for an insert that was used to hold a chair in a shipping container. Usually, the force will be forcing the insert in, like a table. If you must glue them, use an epoxy glue instead of a regular wood glue. The epoxy glue doesn't allow the insert to rust. The regular wood glue makes the insert rust. These are expensive at $1/piece. Brass ones are available for less than 1/2 the cost. The problem with brass inserts is that they have a tendency to break during insertion. If you wax (furniture paste wax) the brass threads right before insertion, they go in nice and easy. Just remember to let the wax harden a couple of months before you apply a force that will pull on the inserts. Pushing on the insert can be done immediately, if you have seated the insert properly in the 1/2" deep hole. Rockler had what I needed. I had to replace metric press-in inserts that failed. No one carries 6mm inserts. I purchases brass 1/4-20 inch inserts and 1/4-20 fasteners. Replacing the plastic inserts with metal ones worked out very well. 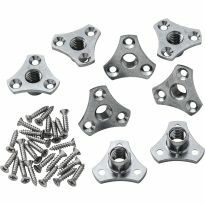 Rockler has a nice assortment of special fastening options. I used these in 1" MDF and they worked great, so much better than the brass ones I have used in the past. Also, huge thanks to the Concord, CA store, these guys are awesome. I use the 1/4 x 20 threaded inserts (5/16" x 18 threads on the outer diameter) for attaching maple necks to the bodies of guitars, like Fenders. I drill 1/4" holes in the maple necks and use a 5/16 x 18 tap to cut threads for the inserts, then lube the inserts with a little ivory soap and thread them right in. The necks are then attached to the guitar bodies with 1/4 x 20 x 2" machine screws This is superior to using wood screws and provides excellent mechanical coupling, making for better tone, volume and sustain. Very glad to find these on the shelf at my local store. 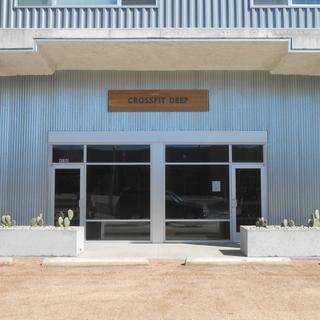 Do a great job of securing an exterior, 90 pound sign to the building. Installation was straight forward. 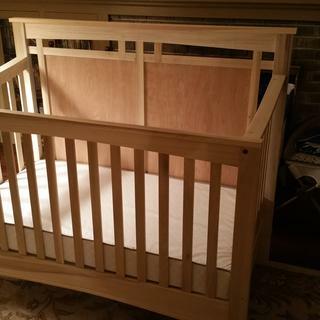 White oak, 2' X 9' X 1"
The product works great on a loft bed i built for my daughter. If you take the time and follow product specs, this is better than other non-fully threaded inserts sold at national hardware chains. I was making a shift know for my car. This worked great. I recommending using a bolt screwed into the center to install the insert, Much easier than trying to do it with a screwdriver. I was surprised by how many of these things I actually have used. I needed to mount a jig on my router table and these really did the job very nicely. I use the threaded inserts on some of my lathe turnings; like, bottle stoppers. I like being able to remove/reinstall the turning. The insertion tool is awesome! Any other insert is a poor choice- this insert I have used for years in maple, without incident. 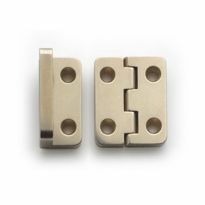 Rockler is the only source for this well machined hardware. You will not be disappointed. I make beer tap handles out juniper. steel doesn't break like brass! With so many hardware stores--the neighborhood shops you could count on to carry every little thing and anything, having closed, it's good to find something so simple and well made. These inserts are not cheaply made and imperfect. We needed them for a Cub Scout project and these inserts worked like a charm. 8-32 pilot hole should say 9/32 for hardwood. The parts I received in November 2011 had outside diameter of 10/32. The inserts fell into and out of 5/16 hole. They worked in a 9/32 hole. Heavily waxing the outside threads with candle wax made installation possible in walnut door pulls. I used a wide blade screw driver to start and a narrower blade to finish installing the insert. I bought both the 1/4-20 and 5/16-18 inserts to attach the head- and foot-boards to the base of a platform bed. After reading comments regarding installation from another reviewer, I decided to use the bolt-and-double-nut method to install them. It was easy to do and worked perfectly! No damaged inserts. I expect to be using these again in the future. I have used these in the past. I make bookcases that are to be disassembled for easy relocation. The use of threaded inserts allows for easy disassembly and rebuilding as sturdy as originally planned. Very good inserts, used for cabinet feet. 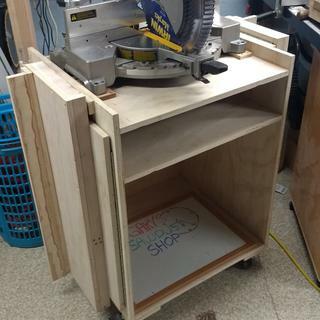 I am building a computer desk with pull out drawers for the CPU, printers etc. Over time and equipment replacement the sizes of these components change. To make the drawer slides easy to adjust for height I plunged 1/4 inch holes like you would for shelf pins. Then I inserted the threaded inserts into the holes. I positioned the holes to align with the slide mounting holes. Now it is very easy to make height adjustments without the need to redrill mounting holes which can be very difficult in a narrow compartment. Before asembly of the project, I used an 8-32 screw with a thread insert and jam nut in a reversible drill to prethread each plunged hole. This way I don't need to put a threaded insert into each available hole. It's now easy to remove the insert and move to the next hole when needed. The project is in construction at present. I have used threaded inserts for many projects. In the past, I have been able to find a threaded insert that could be tightened with an Allen wrench. If you want to top of the insert below the work piece surface, an Allen wrench would make that trivial. The slots in the threaded insert are definitely not screw driver friendly. Worked great after I chased the 1/4 20 threads. the screwdriver slots do not work well. The insert wants to wobble or walk. Made an insert tool out of a hex head bolt and it worked great. Had some inserts that needed tapping, burrs from cross slot were interfering with 5/16 internal threads. Worked good after threads were tapped. These threaded inserts do the job they were designed for very well - once you get them installed into the wood. That's where they can be tough to work with. Going into hardwood was a problem as the slot just didn't work - not enough surface area and too sloppy for a good bite. And you need a huge screwdriver. Instead, I threaded in a bolt with a nut on the shaft and as the insert started to bite into the wood I tightened the nut against the insert and used a wrench on the bolt to finish the insertion. The nut then easily backed off and the job was done. So, one star deduction for challenging to install. Always test these on scrap first. This product did just what I needed to and it resulted in a clean looking finished product. You just have to make sure you have the correct size drill bit. I use inserts for furniture with hardwood legs that can be removed. If the insert hole is too small, the insert (or maybe the hardwood) will fail due to high stress during insertion. If you make the hole too big, it won't get "grip". With brass, I found the correct hole size to be really difficult to find. With steel, the "foregiveness" with hole size is much greater. They worked very good so far. I'll see how long they last to use. I ordered four bags of these inserts (1/4"x 20) and had to run a tap through every one of them before I could get a bolt to fully thread into them. Fortunately I had a tap on hand to clean the threads. Had I not the tools to rework them I would have been more miffed. I understand "stuff" happens and maybe I just got a bad LOT of parts. After rework they worked as they should. I bought the 1/4" - 20 size for use in a project and they worked well. The only negative was that I had to clean up the threads and run a tap through the insert to get the thumb screw that I was using to run freely in it. Out of the package, they're a little rough. Purchased the 3/8 inserts to use in the end grain of cherry to fasten the top and bottom stiles to the legs of bed. Inserts did not hold at all in the end grain. However, they did hold in the regular grain very well so I changed the plans and all worked out OK! These work ok, but the threads were so mis-aligned that, with two of them, I ended up using a tap to fix the threads. Without that, it was extremely difficult to insert the proper size bolt. I also did not care for the flat-head screw mechanism to screw the insert into wood. Others on the market use hex (Allen) wrenches and I find these much easier to use. After experimenting with drill sizes varying from two sizes over to two sizes under the recommended drill size for oak, there is no way to get these to thread themselves perpendicular to the surface of the wood consistently. I guess this is because the variance of hardness of the wood grain. Drilled the holes on a press so they are perpendicular. When a screw is inserted after installation it can be up to 30 degrees off. Only way to do it is to actually tap the hole with a steel tap using a press to keep it perpendicular before installing the insert. Was repairing bedposts. The original Steel Threaded Inserts were 3/4" in diameter . The photo of the Steel Threaded Inserts on the website appeared to be the same size, but were smaller. Had to fill the holes with wooden dowels then drill the smaller hole ("1/2") to accommodate the part shipped. It is steel and the right size. Never tried inserts before...never had the need...now I do. To compare with the brass inserts in regard to ease of installation as well as amount of time to install. Needed these for a project and after reading the reviews I was sold. These are stronger and more durable than regular T-nuts. I am going to try these to attach table tops. Other fasteners don't seem to work too well. I've had very good success with these threaded inserts. A long ago I also got a threaded insert installer from Woodsmith, I believe. I just checked their website, but I no longer found the item. I still have and still use their installer, and combined with these threaded inserts, it's a very sound connection that is easy to install. To make a large wooden legged table portable by making the legs screw in. Special application needed for to attach drawer fronts with no visible handle or pull. There is no other insert that works for end-grain maple. 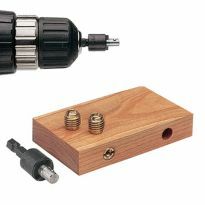 No one sells this insert but Rockler. I stock threaded inserts in my shop of all sizes for future projects. They work wonderfully on projects and jigs. What is the OD of the 3/8" insert? Also what is the recommended pilot hole size when installing in hardwood? BEST ANSWER: From an earlier Rockler order, the tech sheet that came with mine says that for the 3/8"-16, use 1/2" pilot hole in softwood and 9/16" in hardwood. I always do a test in the wood of interest. If properly sized, the wood should not expand noticeably above the surface you insert the insert into. I never had any luck installing them with a screw driver. 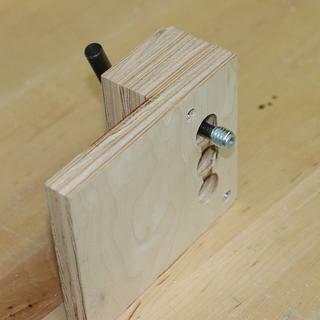 Use a bolt with a couple of nuts and make sure the insert is perpendicular to the board. What are the external thread specifications for all three sizes of these steel threaded fasteners? If they are standard threads, using a steel tap or even a bolt to partially "pre-thread" the drilled holes in hardwoods might be helpful. BEST ANSWER: The external threads are intentionally coarse for better holding in wood and I do not think they are standard threads for which a regular metal working tap would be of assistance. BEST ANSWER: The 8-32 insert is 3/8 long, and the 1/4-20 and 5/16-18 inserts are 1/2 long, according to the Threaded Insert Technical Data sheet linked above. what are the outer dimensions for the 3/8-16 insert also how long is the 3/8-16 insert? Just saw a video that says the slotted end should go in first as it's there to help cut the threads and not for a slotted screwdriver. Is that true? BEST ANSWER: I would say NO! If the slotted end went in first, How do you screw it in? Also, they sale an installation tool that uses the slot. I made my own tool by using a correct size bolt and a lock nut to secure it to the insert. The use a wrench or nut drive to install the insert. Slotted end goes in FIRST, the slots help cut the threads. In a drill press or custom made fixture (watch you tube) use 1/4 inch bolt with a 1/4 in nut backed up by another 1/4 in nut as a lock. Thread the insert on up to the lock nut -apply pressure from the drill press as you turn the nuts into the wood. I saw this video as well, and tried his way, slotted end down. 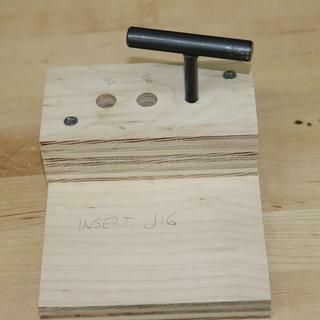 Made a jig with a bolt and two nuts. The insert went in flawlessly, after I had spent an hour experimenting by using a screwdriver. The insert took about ten seconds using the slot down method. Not true, the slotted end is for driving. There is even a tool that helps drive them straight that uses the slot but I imagine either way will work. Does the chamber hole go all the way through? I'm thinking of using this as a leveling mechanism and need a threaded cylinder without a bottom. Good suggestion? : stack more than one insert onto the shaft of a dolly wheel if the shaft is longer than one insert, but less than the thickness of the 2 x 6 I hope to hold it in place. If shaft end is still below wood surface on the opposite side, I plan to bore a larger hole on that side just deep enough for a washer and and double nuts. Sound feasible and strong? Yes, threaded inserts have center holes that go all the way through. Your use sounds like what they are made for. Yes. It is threaded all the way through. No bottom. Would work great for a leveling mechanism. Good Luck! What is the length of the 5/16-18 insert? I have a footstool whose legs are attached via screwing the legs into threaded inserts in the footstool. Unfortunately, the threaded inserts just keep pulling out of the footstool. (Admittedly, it's a cheaply made footstool, but it has sentimental value for my family.) Any ideas on how to make the threaded inserts more secure? Or, alternative approaches to try for attaching the legs? 1. Epoxy the outside thread of the insert into the stool's bottom board. 2. switch to the screw on tee nut style that has 3 screws to secure a plate with the same internal thread. The prong style Tee Nuts will have the same problem as the thread insert unless you can install them on the opposite side of the board in the foot stool. 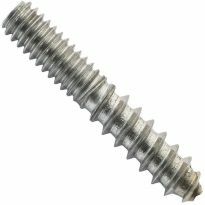 I need to anchor a machine thread bolt to a wood screw anchor. Do these come with machine thread interior ? BEST ANSWER: I have used these directly in wood to anchor machine bolts with satisfactory results. See the rockler catalog for internal machine threads available from 8-32 to 5/16-18. 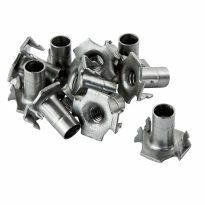 if you are going to join to an anchor already in the wood you may want to consider using a rod coupling nut; there is a much longer thread than you would get with the insert, which is intended for a single bolt. It's been a long time since I used them and cannot remember. Rockler people probably know the thread type or go to manufacture's website. Yes they come with both course and fine threads. 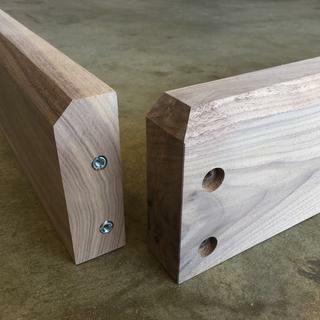 I want to fasten two separate wood rods (1inch dia and 36inch length)end to end. (1)Are threaded inserts good for the job. 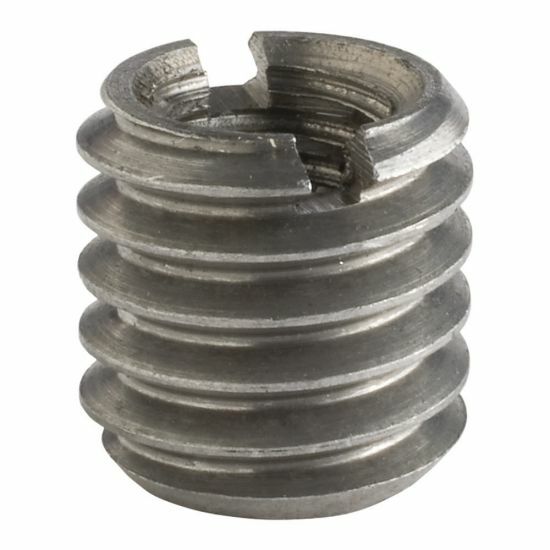 (2) What dimensions of threaded inserts do I need. (3) What other tools do I need? BEST ANSWER: You can fasten the 2 rod together, but it will not support very much weight. i don't think it would be a strong joint! Do you sell the bolts that go with each of these Threaded Inserts? BEST ANSWER: The inserts use standard inside thread sizes. Rockler does carry them in various sizes but so does any hardware store or big box home center. Just order/pick up the length and type that you need. What is the internal thread pitch for the 8-32 insert? It doesn't say on the listing. I am needing an insert with a 8mm 1.25 pitch. BEST ANSWER: 8-32 is a US size meaning a "number 8" at 32 threads per inch. I believe the thread diameter is .16 inch or 5/32 inch. I need very large inserts. One that will hold 5/8"to 3/4" bolts. I need them to sink into the wood, the bolts that is, at least 4 to 5 inches. Do you have them in the size. If not can you tell me where I can get them?